Googling “organizational change” returns almost 6 million hits. The LinkedIn Organizational Change Practitioners contains 26,125 members. With this much information and so many people practicing organizational change, you’d think we’d be good at it. But that’s not what I usually experience in my work. Why does this gap exist? My recent posts have centered around the Satir Change Model. This describes how people respond to change. But how do we change organizations? The Diffusion Model, which says change more or less happens. A common example of this would be communities of practice in an organization. People choose to meet and share ideas and how they accomplish their tasks. Attendees can choose or adopt new ideas and practices, or not. The Hole-in-the-Floor Model, which says change is dropped on changes by planners upstairs. Process improvement committees and “You will now be Agile” mandates fall into this category. The Newtonian Model, which introduces the concept of external motivation to change. Often this takes the form of upper managers creating a sense of urgency, walking around with gantt charts checking to make sure every thing’s reported on schedule, blaming resistors and beating up the laggards. The Learning Curve Model, which considers the time to adapt to something new. On the job training and mentoring fall into this category. Other models exist, but often they fall into one of the above categories. According to the Merriam-Webster dictionary “an administrative and functional structure (as a business or a political party)” describes what I mean when I say “organization”. This means we change an organization by re-arranging its structure. We add a new department (Quality Control), insert a new role (Director of Quality), reassign people, update the HR manuals, and re-draw the development process. Implement the new structure and we’re done! Sort of. If the change doesn’t seem to work fast enough, we can increase the pressure or put motivational posters on the wall. While organizations can change at the drop of a new org chart, people can’t. We miss the old familiar way, aren’t really sure what’s going on, and where this might all finish. 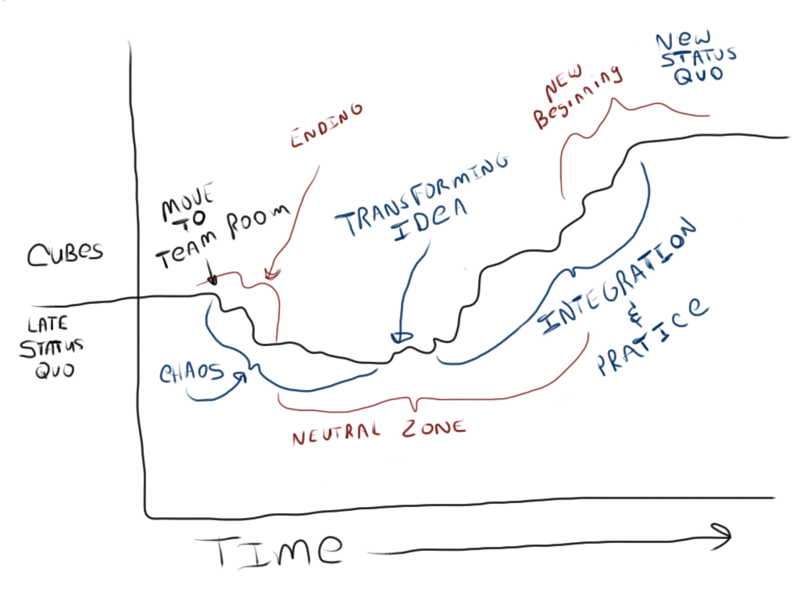 In Managing Transitions, Making the Most of Change William Bridges identifies these three zones as the Ending, the Neutral Zone, and the New Beginning. Ending – Letting go of the old ways and the old identity people had. This first phase of transition is an ending, and the time when you need to help people to deal with their losses. Neutral Zone – Going to an in-between time when the old is gone, but the new isn’t fully operational. We call this time the “neutral zone”: it’s when critical psychological realignments and repatternings take place. New Beginning – Coming out of transition and making a new beginning. This is when people develop the new identity, experience the new energy, and discover the new sense of purpose that make the change begin to work. Moving to the team room represents the change. Make the announcement and move. I’ve seen teams pick up their computers, manuals and move. I’ve worked where “facilities” moved the equipment and books over the weekend. Either move has a discrete start and end. The change announcement starts the transition process. After the equipment arrives and they’re sitting in the team room, they start to adapt to their new surroundings. They may establish times when the team tries to stay quiet. Two or three may go to the whiteboard and have a conversation about a piece of code. They develop simple rules for handling interruptions. Eventually the team room becomes the norm. Team members become comfortable with the change to the team room. I’ve seen those most opposed to moving become ardent supporters for the change. Not everyone in the organization completes the transition started by the change. Those who do make the transition from ending to new beginning do so at different rates. You can help people understand and transition quicker. Bring in a change artist like me who has domain experience and has helped other organizations and their employees through the change/transition process.